But creation is defined by the scholastic theologians as, that which is a product or emanation from the universal cause of all Being, which is God. The scholastics inherited the concept of emanation from the Neo-Platonic commentators on Aristole and from Philo, the latter of whom Pareus does not follow. Yet, Pareus, either wittingly or unwittingly, follows the same interpretation, bringing a Christianized Platonic reading into Reformed doctrine. He continues, quoting Aquinas in refutation of the slogan “nothing is made from nothing”, a slogan used against the Christian doctrine of creation ex nihilo. Thus from the principle of the Physici: Nothing is made from nothing: creation is not abandoned: because, as Thomas says, it is only true concerning the emanation of particular effects from particular causes, which necessarily presuppose something in their own action: because they act by motion: that is, it is only true concerning the effects of secondary causes, of nature or art, which are not able to be made apart from preexistent matter, because of the weakness of causes. But it is not true concerning the effects of the First Cause, either immediate or extraordinary, so the first things of nature itself are produced from nothing, or produced by miraculous immutation, made by the power of God. Here, Pareus follows a scholastic and thoroughly Aristotelean concept of exemplar causes. 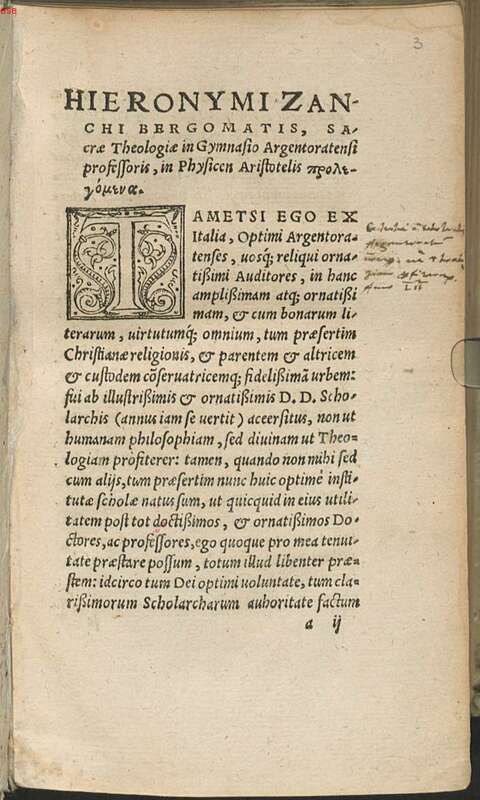 Augustine spoke of the Platonic ideas as exemplar causes, Vermigli followed him, and Pareus follows the scholastic interpretation of Aristotle with a certain tinge of Neo-Platonism.